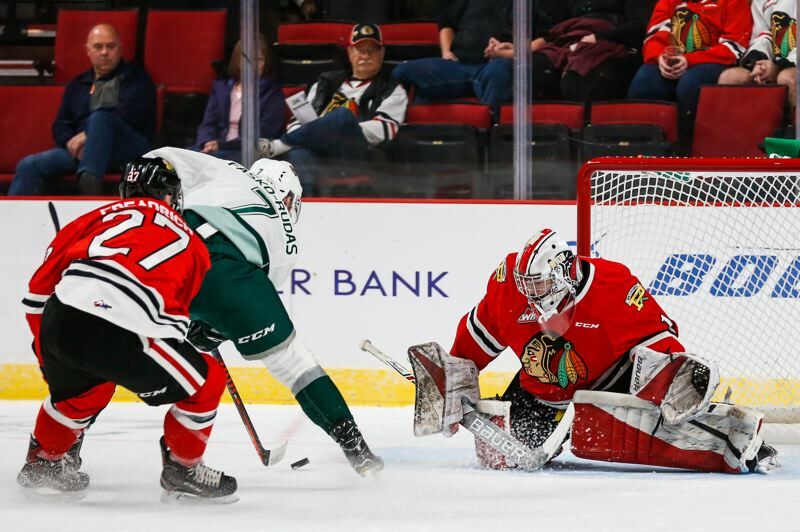 Portland will attempt to start another winning streak on Friday when it plays host to the Vancouver Giants at 7 p.m. at Moda Center. A 4-2 loss to Everett on Sunday ended a run of five consecutive wins. It happened in unlikely fashion, as the Winterhawks' productive power play failed to score despite 10 chances. That dropped Portland from a Western Hockey League-best 36.4 percent to second at 29.6 percent (16 goals from 54 power plays). Team captain Cody Glass (15 goals) and linemate Joachim Blichfeld (14) still rank 1-2 in WHL assists. Blichfeld is tied for first in points (22) and tied for second in goals (8). At 5-3-0-1, Portland is tied for second in the U.S. Division with Seattle, one point back of Everett. The Hawks will travel to British Columbia on Saturday for a second game against Vancouver. Entering play Tuesday, the Giants were 8-1-1-0 and leading the B.C. Division. Portland State has had a good two weeks. After winning at Montana, the Vikings took care of business last Saturday, beating winless Northern Colorado, 35-14. It was 25-0 in the third quarter, as "Hillsboro State" rolled in the only game it'll get to play this year at Providence Park. The players appreciated the chance to have a true home game, and now the Vikings — despite having to open with money games at Nevada and Oregon — have a chance to get to .500. They have a bye this week, then will take a 3-4 overall record and 2-2 Big Sky mark to Sacramento State for a 6 p.m. kickoff on Saturday, Oct. 27. The Hornets are 2-4, 0-3. They won 28-25 at Northern Colorado and lost 41-34 at Montana. The Viks, bouncing back from an 0-11 2017 season, have showed they can beat the teams they should (College of Idaho, UNC) and are capable of winning a tough game against a similar foe (Montana). Their defense and kicking game have improved in particular from last year. The offense has been more efficient (fewer turnovers), but more yards from the running backs and big vertical plays would come in handy the rest of the year. Can the Vikings beat a team that, on paper, is ahead of them? That would be another huge step, and they'll get three chances to do that in the final three weeks of the regular season, when they play host to Idaho State (4-2) at Hillsboro Stadium on Nov. 3, go to North Dakota (4-2) on Nov. 10, and meet Eastern Washington (5-2) in Hillsboro on Nov. 16. As mentioned here before the PSU-Montana game, the Grizzlies are no longer the national power material they once were. They went down at North Dakota on Saturday, 41-14, perhaps still a bit hung over from allowing the Vikings to come back and beat them 22-20 on their home field. With four weeks left in the Northwest Conference regular season, Whitworth (3-0) is in the driver's seat, leading three teams at 2-1 (Puget Sound, Linfield and Pacific). The Pirates, ranked 18th in NCAA Division III poll, already have beaten No. 24 Linfield (19-14). They'll visit Puget Sound on Saturday and play at home against Pacific on Oct. 27. UPS has Linfield in Tacoma, Wash., on Nov. 3, and Pacific visits Linfield on Nov. 10. The University of Portland men (10-0-3, 2-0-1) probably feel they dropped points after their 1-1 draw with San Diego on Sunday at Merlo Field. The Pilots are atop the West Coast Conference standings with seven points, but Saint Mary's (13-0, 2-0) looms one point back. The Pilots will play their next three games on the road against San Francisco, Santa Clara and Pacific before closing the regular season with a Nov. 10 showdown against Saint Mary's at Merlo Field. • The Portland women are one of four teams tied for second in the WCC at 3-1. After a weekend off, the Pilots (10-5 overall) are away Friday to take on Santa Clara (12-2-1, 3-1). A Sunday match at San Francisco (9-5-1, 2-1-1) follows. The remaining home games for the UP women are Oct. 26 against Loyola Marymount and Oct. 28 against Pepperdine. The up-and-down Oregon Ducks were both last weekend. They won at Colorado, then were without three key players two days later (suspended for violation of team rules) and lost starting outside hitter Taylor Borup to a leg injury midway through a match at Utah. Down to six players, No. 14 Oregon won the third set and nearly pulled out the fourth, which would have made things hugely interesting at Salt Lake City. But the 3-1 loss bumped Oregon out of a second-place tie in the Pac-12 with a big home weekend on the horizon (7 p.m. Friday vs. Cal, 11 a.m. Sunday vs. No. 2 Stanford on ESPN2).